Australian Wingless Sprint Championship history was created tonight at Sydney’s Valvoline Raceway, when Joel Chadwick became the first back-to-back winner in the event’s 10-year history. After winning the previous night’s preliminary feature race in impressive fashion, Chadwick, whose back-to-back wins is now five Australian Championships for the state of South Australia (adding to that tally are Chadwick’s double, Todd Wigzell’s pair of wins in 2012 and 2015 and Rory Button’s inaugural win in 2009), started from the outside of the front row for the 2018 Australian Championship deciding feature race. 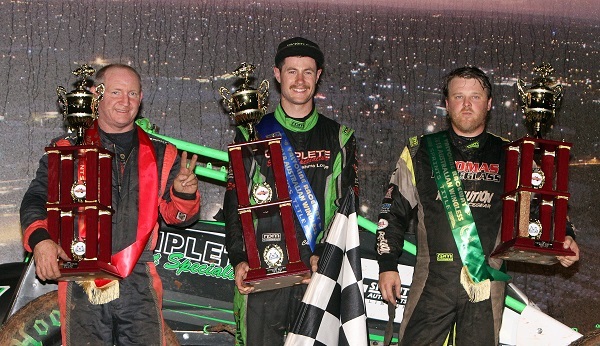 Lined up beside pole sitter and Valvoline Raceway track specialist Mark Blyton (NSW), Chadwick battled for the lead with Blyton before taking full control of the lead after a dozen completed laps. From there, he was never headed for the remainder of the 35-lap event. Despite the best efforts from Blyton, he had to settle for second behind Chadwick in what turned out to be a career-best finish for the veteran racer in a title event. In a feature race that impressively went 30 laps without a single caution period, there were two stoppages in the closing stages, which also included a return of the wet weather. Lap 30 saw the race brought to a halt after heavy contact between David Eggins (NSW) and two-time Australian Super Sedan Champion Peter Logue (Vic) on the main straight resulted in Logue, who had earlier won the B main, crashing into the outer tyre wall. Both drivers weren’t injured but they were retirements. As they say in motorsport, caution periods breed caution periods, and that’s exactly what occurred, when three laps later, youngster and Valvoline Raceway newcomer Matthew Iwanow (WA), who was running in eighth place after qualifying fifth, spun around entering turn four and sustained race-ending damage in the process, while Anthony Tapley (SA) also spun in the incident. While Iwanow was sidelined, Tapley was able to restart at the tail of the field. With a two-lap sprint to the chequered flag, the rain began to fall, and that certainly created yet another challenge for Chadwick as he came up to tackle the green, white, chequer. Handling the pressure of a greasy, unpredictable track surface with ease, he went on to put together two trouble-free laps and was rewarded with back-to-back Australian Championship wins. While Chadwick and second-placed Blyton greeted the chequered flag without too many dramas, the battle for third place was certainly intense and it was only decided as the drivers raced towards the finish line. In the end, it was current NSW Champion Dean Thomas (NSW), who earlier in the race dropped back towards the foot of the top 10, who stole the final spot on the podium away from Jason Bates (NSW). 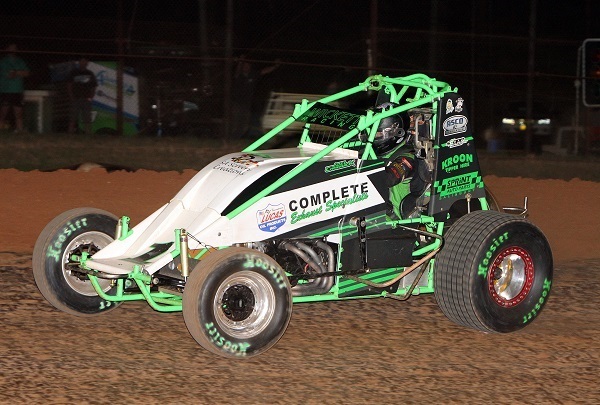 Bates, the 2016 NSW Champion, was sitting third up until the final corner, when contact from behind slowed him and it allowed the defending Valvoline Raceway Track Champion to pip him for the spot. Behind Bates in fifth was current Tasmanian Champion Luke Redpath (Tas). After starting from position 8 in tonight’s feature race, Redpath showed plenty of pace throughout the weekend in what was his Valvoline Raceway debut and he was rewarded with a satisfying top-five result. A position 13 starting Travis Millar (Vic), one of the weekend’s surprise packets Andy Hibbert (Vic), current Northern Territory Champion Troy Carey (NSW) charged home from position 15, two-time Australian Champion Daniel Hartigan (WA) and impressive Kyle Mock (NSW) rounded out the top-10 finishers. The remaining finishers consisted of Luke Sayre (NSW), Clint McLaren (Vic), Peter Granger (NSW), current Queensland Champion Daniel Flood (NSW), Glenn Wright (Qld), Matthew Symons (Vic), Luke Weel (Vic), current Victorian Champion Glenn Watts (Vic), Tapley and Michael McDonald (Vic). Apart from Eggins, Logue and Iwanow, the only other Australian Championship decider retirement was Jeff Thomas (NSW), who had started from position 3, and retired on lap 14, due to a fuel pump failure. Mother nature reared its ugly head during the middle of tonight’s racing, when it brought the night’s proceedings to a stop, due to wet weather front, for over an hour following the completion of the fourth and final round of heat races. Earlier in the night, the heat-race wins were claimed by Peter Logue, Chris Halesworth (Vic), Carly Walsh (Vic), Watts, David Cook (Vic), Eggins, Weel and Tony Moule (Vic). 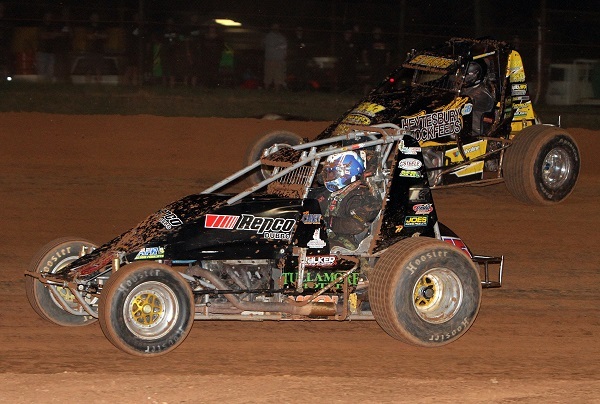 In the fourth and final round of heat races, it saw seven of the eight winners reside in the state of Victoria. In the march to the Australian Championship deciding feature race, following the rain delay, the E main was claimed by Shaun Lyness (Vic), the D-main win went the way of Leighton O’Brien (NSW), following the family’s winning form was Mitchell O’Brien (NSW) who drove to victory in the C main, and the final four Australian Championship decider spots on offer in the B main were filled by Peter Logue, who drove to a hard-charging race to win ahead of fellow transferees: Wright, Weel and McDonald. The biggest incident from these last-chance events occurred in the D main, when Steve Thomas (NSW) rode out a huge wreck on lap five in between turns three and four. Although the eldest of the Thomas siblings wasn’t injured, the same couldn’t be said for his car which was destroyed. Please Note: All Australian Championship results are to remain unofficial, up until engine checks are completed, which are required to be done within a 21-day period. Appreciation Post: The entire Australian Wingless Sprint Racing committee would like to thank the drivers, pit crews, supporters, officials from the Sprintcar Association of NSW and the Valvoline Raceway team, for their wonderful efforts throughout the weekend that helped make this season’s Australian Championship one of the best. Get Social: For further AWSR information, visit their website at www.awsr.com.au or LIKE them on Facebook or Follow them on Instagram and Twitter by searching Australian Wingless Sprint Racing.